Western blot analysis of extracts from various cell lines using ITK (E4X7M) Rabbit mAb (upper) or β-Actin (D6A8) Rabbit mAb #8457 (lower). Immunoprecipitation of ITK from Jurkat cell extracts. Lane 1 is 10% input, lane 2 is Rabbit (DA1E) mAb IgG XP® Isotype Control #3900, and lane 3 is ITK (E4X7M) Rabbit mAb. 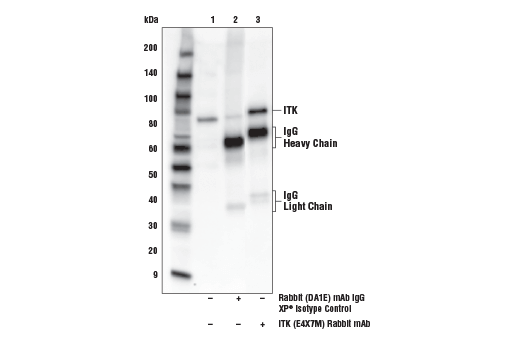 Western blot analysis was performed using ITK (E4X7M) Rabbit mAb. 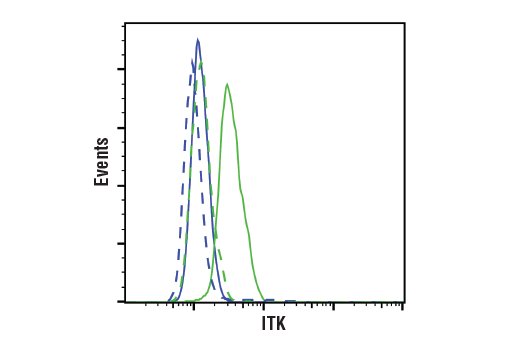 Flow cytometric analysis of Ramos cells (blue) and Jurkat cells (green) using ITK (E4X7M) Rabbit mAb (solid lines) or a concentration-matched Rabbit (DA1E) mAb IgG XP® Isotype Control #3900 (dashed lines). Anti-rabbit IgG (H+L), F(ab')2 Fragment (Alexa Fluor® 488 Conjugate) #4412 was used as a secondary antibody. 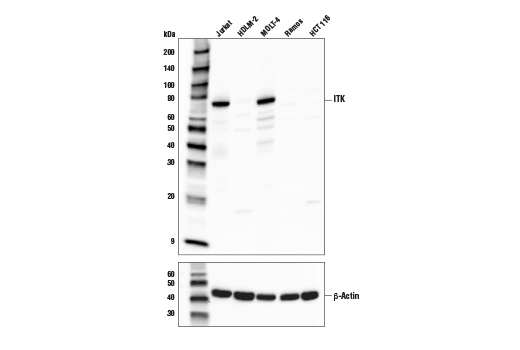 ITK (E4X7M) Rabbit mAb recognizes endogenous levels of total ITK protein. Monoclonal antibody is produced by immunizing animals with a synthetic peptide corresponding to residues near the carboxy terminus of human ITK protein. Interleukin-2 inducible T-cell kinase (Itk, Emt or Tsk) is a member of the non-receptor protein tyrosine kinases. Family members of Itk include Tec, Btk, Rlk and Bmx and are all defined by a common structure: an amino-terminal PH domain, a Tec-homology domain and a SH3 and SH2 domain followed by a carboxy-terminal kinase domain (1). Tec, Rlk and Itk are expressed in T cells and activated in response to T cell receptor (TCR) engagement. Data demonstrate that Itk functions in signal transduction downstream of TCR and activates PLCgamma1 and Erk. Lck directly activates Itk through phosphorylation in the conserved activation loop at Tyr511, and furthermore, Itk is autophosphorylated in the SH3 domain at Tyr180. Itk-Y180F is still capable of phosphorylating PLCgamma1 in contrast to Itk-Y511F, which has lost that function (2-3). Itk -/- mice show reduced lung inflammation, eosinophil infiltration and mucous production in response to allergic asthma induction. Thus, Itk could become a desirable target for anti-asthmatic treatments (4). Schwartzberg, P.L. and Finkelstein, L.D. (2005) Nat Rev Immunol. 5, 284-95. Heyeck, S. D. et al. (1997) J Biol Chem. 272, 25401-8. Wilcox, H.M. and Berg, L.J. (2003) J Biol Chem. 278, 37112-21. Mueller, C. and August, A. (2003) J Immunol. 170, 5056-63.